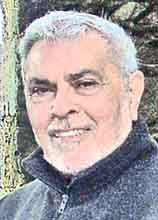 I was born in India in 1933 and moved to London in 1954. I have lived in West Germany and briefly in Canada and have travelled in Europe, Asia and the Far East, Africa, Australia and North America. After studying engineering drawing, I served as a draughtsman in the RAF before obtaining a City and Guilds Diploma in Technical Illustration at the London College of Printing. Later I moved to the south coast and studied fine art at Eastbourne College of Art. Working in oil, acrylic and watercolour, then adding mixed and found media, I produce drawings, paintings and collages. A key feature of my work is a method I have developed which involves scorching the surface of the canvas to create fusion, edge and texture. Having recently acquired a small etching press I am now expanding my ideas with monoprints using collagraph and drypoint and experimenting with cyanotype and chemigrams. Many aspects of my work, including the abstract are, in the first stages, informed by my training in draughtsmanship and illustration. After that I break the mould, moving further and further into the senses, concentrating on creating dynamic forms and atmosphere.